Remember those great yellow peppers I mentioned on sale for .10 cents at Stanelys (see my post (titled Spinach and Yellow Pepper Salad)? These were the perfect size for a stuffed pepper! I find the larger size just too big. 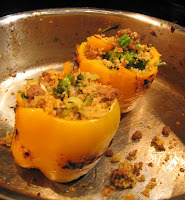 You can never eat it all and a stuffed pepper is really best the night you make it. Reheating does not really do this justice. Using a roasted pepper will give you much more flavor to your dish. You will find the little smoky-charred flavor give some character and depth to your pepper. You can roast pe ppers on your outdoor grill (personally my favorite way as I feel this offers the best flavor), under your broiler or just on top of you gas stove, as shown to the right. There are so many options of what to stuff the pepper with- sausage and rice, bread crumbs and cheese, hamburger mixture....really it's endless! 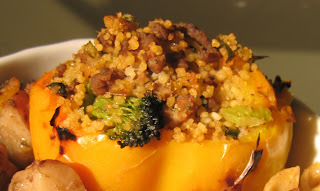 I chose to create a turkey-couscous mix with vegetables for a healthier option. But as always, feel free to add in something extra if you have, try to shake it up a little! Your the master of your tastes, so vary my recipes to your liking! No matter what you end up, just enjoy the fact that you made it, and be fat and happy! This is another real simple recipe to put together. Prepare 1 cup of couscous according to the directions. 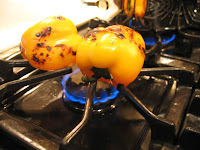 Begin to roast your peppers. Simple place them directly onto the grates above the flame, nothing else is needed. Leave the stems on to turn. Turn as each side begins to brown/blacken. Add this to the couscous, set aside. Now sautee 1/2 lb ground turkey (use the same pan you just had the veggies in.) Add salt, lots of black pepper, 1/2 tsp of red pepper and about 1 tablespoon of ground (or leaf) thyme. Ground turkey meat is dry and bland, so i like to add a little olive oil to the pan and I tend to over season for my tastes. Once the meat is all browned, add to the couscous and toss. Cut out the stem and middle sections of the peppers. Now fill the peppers with the couscous-turkey mixture. Place them gently into the meat pan and put in the oven for about ten minutes of final heating and to let the flavors meld. You could serve without placing in the oven unless you want to add cheese, then you will definitely need to put them in the oven to give the cheese a chance to melt. Serve immediately.